The Canadian Sphynx cat was not the first hairless cat to be discovered. Mexican hairless cats date back to Pre-Columbian times (prior to 1500's) and even back to the Aztecs. 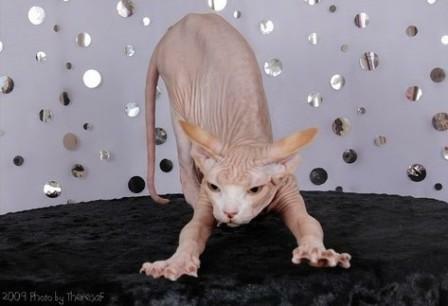 More recently however, hairless cats have been documented in various places around the world. 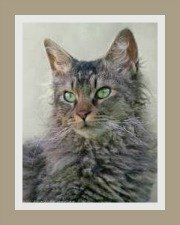 Let's take a look at the Sphynx history. 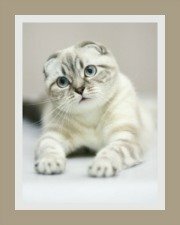 Professor E Letard documented the mutant 'allele h' gene in two hairless kittens of Siamese cat breed parents. A Ms Micalwaith's female domestic shorthair cat gave birth to a hairless male kitten, aptly named Prune. Prune and his mother Elizabeth produced further hairless kittens. A breeding program was initiated and the CFA granted the breed provisional status. Sadly this was later withdrawn due to the high incidence of health problems. 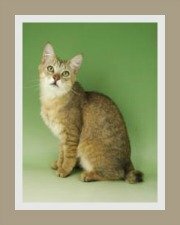 A breeding pair (descendants of Prune) were sent to Dr H Hernandez where they were crossed with a Devon Rex cat - the purpose being to further develop the breed. Milt and Evelyn Pearson discovered a hairless kitten on their farm in Minnesota. A year later this kitten was joined by another hairless kitten. Both kittens (Dermis and Epidermis) were sold to Kim Mueske who tried unsuccessfully to breed hairless kittens. 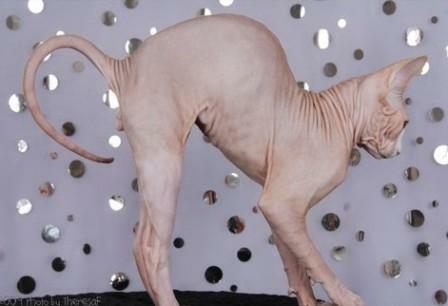 A geneticist suggested she breed the female hairless cat back to her male off-spring. As luck and genetics would have it, the result of this union produced 3 gorgeous hairless kittens. 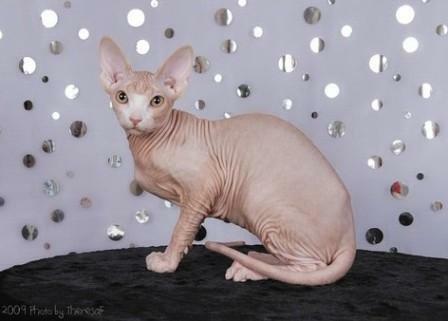 Ms Gattenby, also of Minnesota, purchased hairless cats from the Pearson's and started her own hairless cat bloodline. She then out crossed her cats with Devon Rex cats and then crossed them back to her hairless cats. By doing this, she improved and developed the Sphynx which we know today. 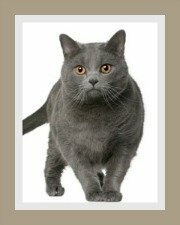 Breeders continue to breed the Sphynx to shorthair cats and then back to hairless cats to create a genetically sound gene pool. A Ms Smith adopted 3 Canadian Sphynx cats, called Bambi, Punkie and Paloma - the modern Sphynx is also descended from these natural mutations. It is a spontaneous mutation which is caused by the recessive 'allele hr' gene. Recessive means it can skip many generations before it once again comes to light. 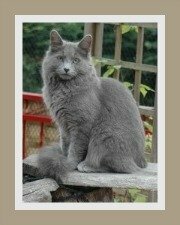 Some people believe that it is a natural mutation that occurs in the cat population every 15 to 20 years. 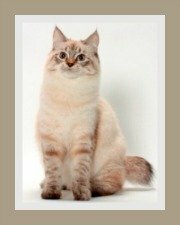 The recessive gene which causes hairlessness can apparently appear in almost any cat breed!